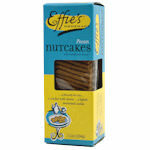 Effie's Homemade Cocoacakes is their signature Oatcakes with a chocolate-y twist. 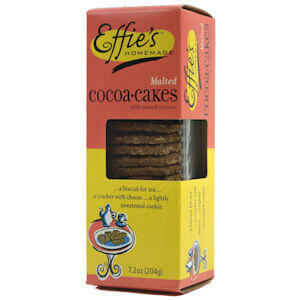 Effie's Cocoacakes are crisp, buttery cookies lightly malted and layered with toasted coconut. They are not your average chocolate chip cookie, not that sweet, but deliciously different. 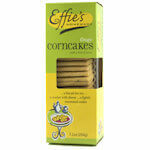 If you like the other Effie's, you certainly need to try this one as well. Deep flavor, dark color. 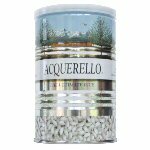 They are great by themselves, but they're also wonderful when paired with other specialty foods. Try with creamy cheese, a Just Jack, a mild cheddar, a creamy blue, or with Mascarpone; make you own rectangular ice cream sandwich or use them to make a cheesecake foundation. Ingredients: Wheat flour (contains malted barley flour), butter, oats, sugar, organic barley malt extract, dried coconut, cocoa (processed with alkalai), water, kosher salt, baking soda, turbinado sugar. Made in a facility that also processes eggs, milk, peanuts, soy and tree nuts.